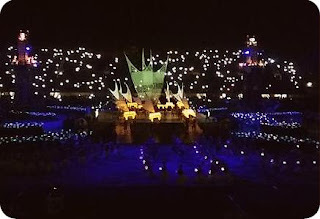 PORT MORESBY – Dika Toua, lit the Port Moresby 2015 Pacific Games cauldron on Saturday evening, concluding a night of colour, music, dancing and fluttering feathers that celebrated Papua New Guinea’s rich culture and opened the fifteenth Pacific Games on Saturday (4/7). Toua, one of Papua New Guinea’s most decorated athletes, took to the heights of the stadium to set fire to a conch shell after HRH Prince Andrew, Duke of York (GBR) declared the Games open. The ceremony began with 1000 women and children performing under blue lights that simulated waves surging and splashing from one end of the stadium to the other. The waves came together to represent an serpent that harked back to the father of the hiri trade, Edai Siabo, who is said to have been given the knowledge that was needed to establish the exchange system by an eel. Next, attention was drawn to the 12 traditional trade canoes surrounding the stadium, these lakatoi were flanked by women bearing pots and surrounded by dancing Motuans. This imagery aimed to represent the importance of the hiri trade in the development of early Papua New Guinean society, and particularly the movement of clay pots in exchange for sago. Young women were then revealed atop four towers in each corner of the stadium’s grassed area, chanting to summon their respective villages’ lakatois and the children carrying illuminated home-made lanterns. The children surrounded two crab claw sails as they were raised to vertical by the descendants of the Boera villagers, the founders of the hiri trade. The stadium then fell into darkness as the chilling sago beating song echoed through the crowd. The ceremony then moved on to the call to nation with the four regions of Papua New Guinea – the Southern, Momase, New Guinea Islands and Highlands – being drawn into festivities. The drummers beat out a rhythm that heralded the beginning of the sing-sing, and the most spectacular part of the evening. Sing-sing groups from all corners of the country came together, swaying, bouncing, stamping and chanting in a spectacular scene that only could happen in Papua New Guinea – but never before has it been seen on this scale. As the sing-sing came to an end, all eyes turned to the entrance of a large PNG flag and a group of young locals who recited words from the PNG constitution, celebrating the country’s 40th year since independence from Australia. Next entered the stars of show; the athletes. 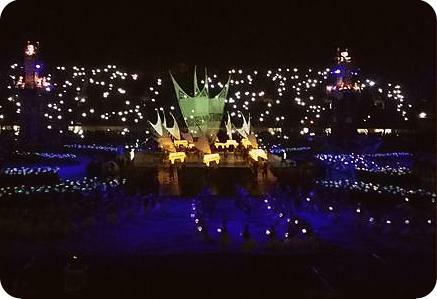 Led by New Caledonia, the 24 nations represented at the Games marched into the stadium with many pausing on the main stage to perform a impromptu version of their respective national dances. Of course, the biggest reception came for the hosts, led by flag bearer Linda Pulsan who held the PNG flag aloft in reverence, stopping at centre stage as her team flowed past her. More dancing followed on the central stage before a string band brought the athletes’ parade to a crescendo. With the athletes in place around the performance area the ceremony continued, depicting the development of Port Moresby into a modern city. A city skyline was held high by performers on the stage while masked people carrying representations of the modern trappings of Port Moresby – cars, planes, ships and helicopters – mimed the the hectic thoroughfares of the host city. With the cultural aspect of the ceremony out of the way, it was time for the formalities. The Pacific Games ceremonial flag was raised before a prayer and then the athletes’ and officials’ oaths. Next there were speeches by Emma Waiwai (PNG), chair of the PNG 2015 Pacific Games Organising Committee, Pacific Games Council President Vidhya Lakhan (FIJ) and PNG Prime Minister Peter O’Neill. Waiwai said that she believes that the Games have been a powerful catalyst for change in Port Moresby. While O’Neill followed up with a vote of confidence for the Games. “I know these games will be the best ever. The facilities we have built for you are world-class and they will continue to benefit our Pacific region for years to come. This is a great time to live in the Pacific, we have a great future ahead of us.” he said.